Over the past two years, the future of 30th Street Station and the surrounding area in University City has been a central focus of local stakeholders, including Amtrak, SEPTA, PennDOT, Drexel University and Brandywine Realty Trust. If Philadelphia's main transportation hub is looking weathered in 2017, the $6.5 billion investment tied to the city's ambitious 30th Street Station District plan will ensure that the station better fits into the urban environment in the coming decades. A public open house held by Amtrak on Wednesday evening offered another glimpse of how the station is set to transform in the first phase of the long-term redevelopment. Designers FXFOWLE, !melk and ARUP jointly presented their vision for the Station Plaza, whose main objective is to create a more pedestrian-friendly, welcoming and integrated civic space. 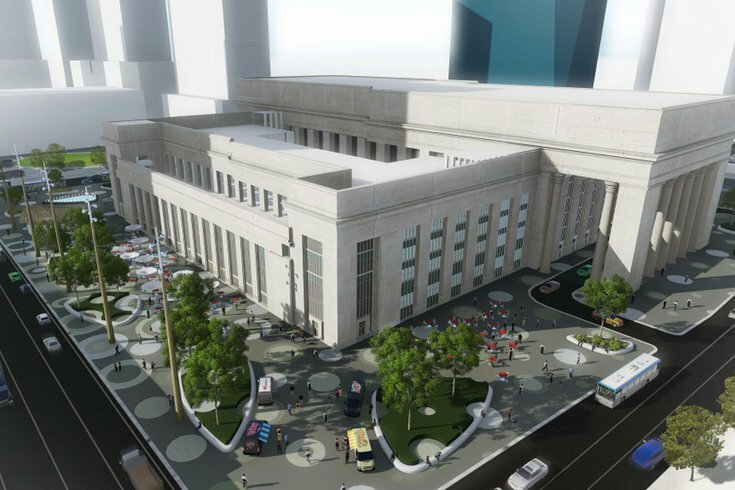 Rendering of view from Market Street. 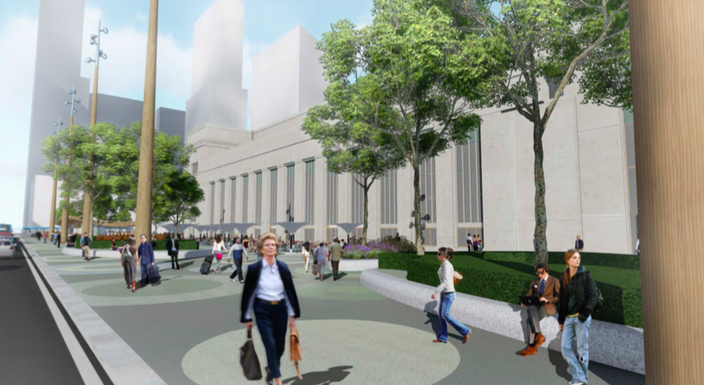 Key features of the Station Plaza proposal include a new West Portico entrance for improved pedestrian access, a stairwell that will connect to the planned SEPTA-Amtrak underground connection and the relocation of taxi queues to zones on the northeast and northwest sections of the station. Construction on the Station Plaza is expected to begin around 2020, with an anticipated completion date around 2029. "30th Street Station was never properly 'grounded' into Philadelphia's urban fabric," said an informational guide from the open house. "A magnificent station deserves a spectacular plaza." Rendering of view toward West Portico plaza. 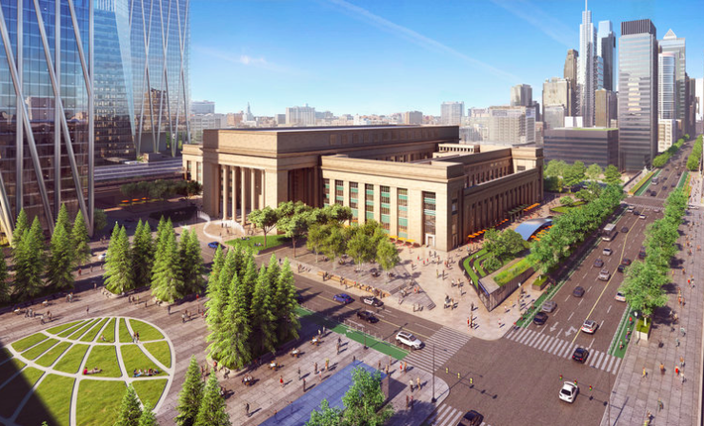 The full scope of the 30th Street Station District plan, projected over a 35-year timeline, covers an existing site with 88 acres of rail yard. Eighteen million square feet of new development and 40 acres of new open space will be added to the area over the course of the plan's execution. In total, the revitalization and upgrades in University City will entail an investment of about $10 billion. Rendering of proposed Station Plaza. At the start of 2017, the Philadelphia-based American Institute of Architects presented design firm Skidmore, Owings & Merrill LLP with a Regional Urban Design award for what it described as the "daring" but achievable 30th Street Station District plan. Projected 2050 skyline surrounding 30th Street Station. 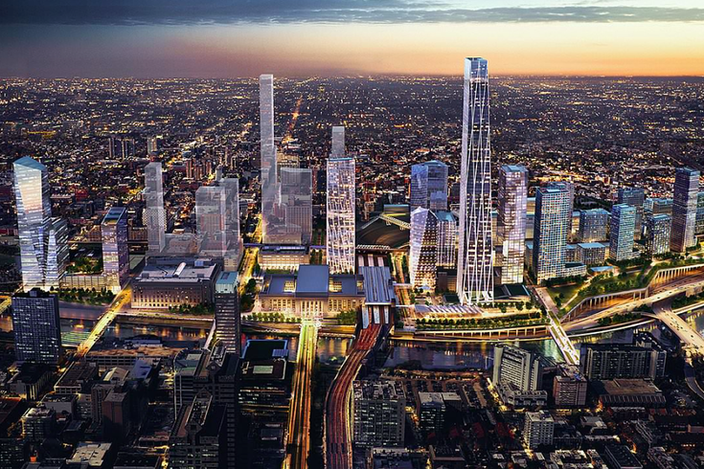 The project's evolution figures to parallel the $3.5 billion development of Schuylkill Yards, a "knowledge neighborhood" planned in a partnership between Drexel University and Brandywine Realty Trust. 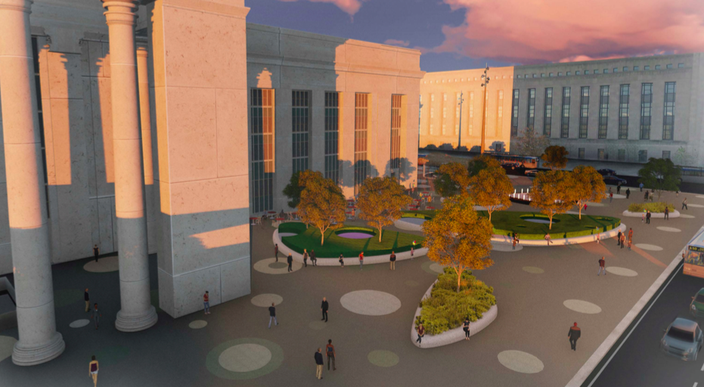 A complete timeline and further information about the 30th Street Station District can be found at the project's public website.